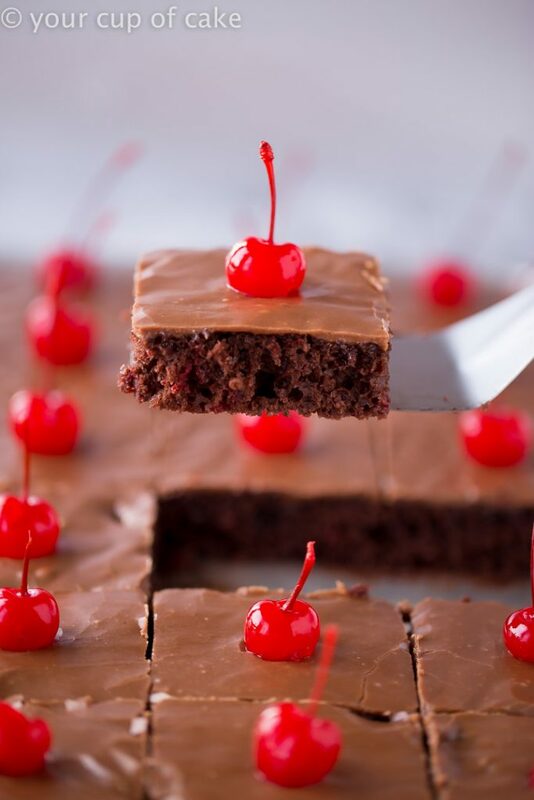 Texas Sheet Cake just got even better with a dose of cherry goodness! 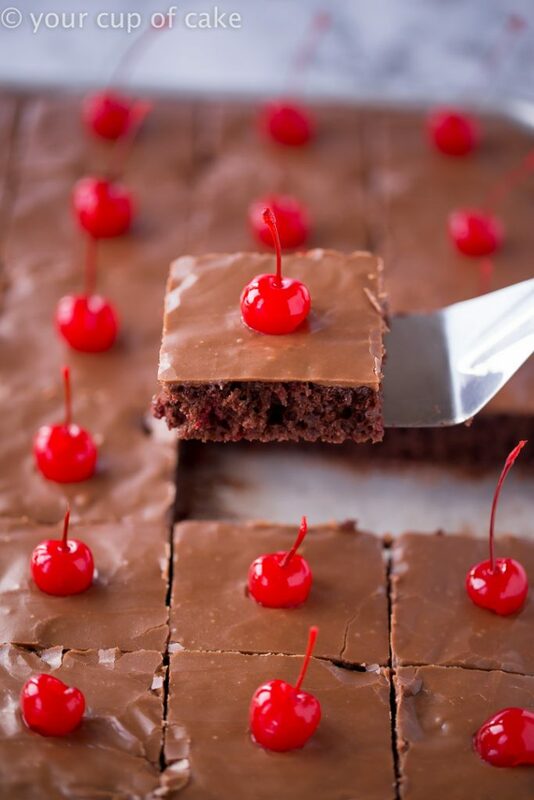 This Chocolate Cherry Texas Sheet Cake is dripping in chocolate icing and perfectly soft! 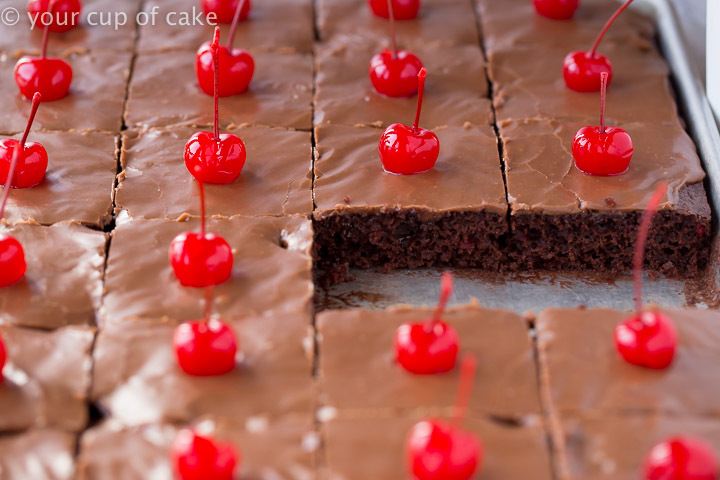 I am in love with Texas Sheet Cake! 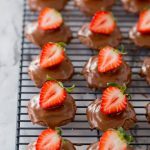 So in love with it that I made some delicious Texas Sheet Cake Cookies the other day! But this is a cake I used to make years and years ago but revamped it to make it even better! If you love Texas Sheet Cake and cherries you will be obsessed with the Chocolate Cherry Texas Sheet Cake recipe! It’s super easy thanks to a cake mix and cherry pie filling. Just mix up the rich chocolate icing while it’s in the oven and then pour it over the warm cake! Mmm… I’m really wanting another slice. 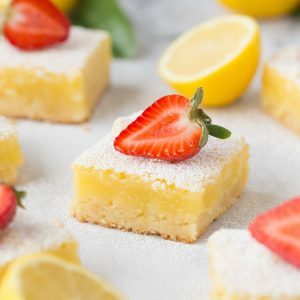 Love sheet cake recipes? 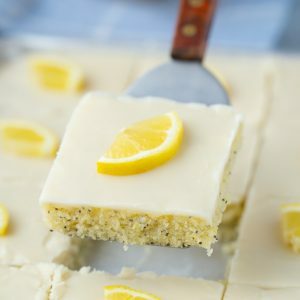 My Lemon Texas Sheet Cake is a MUST! 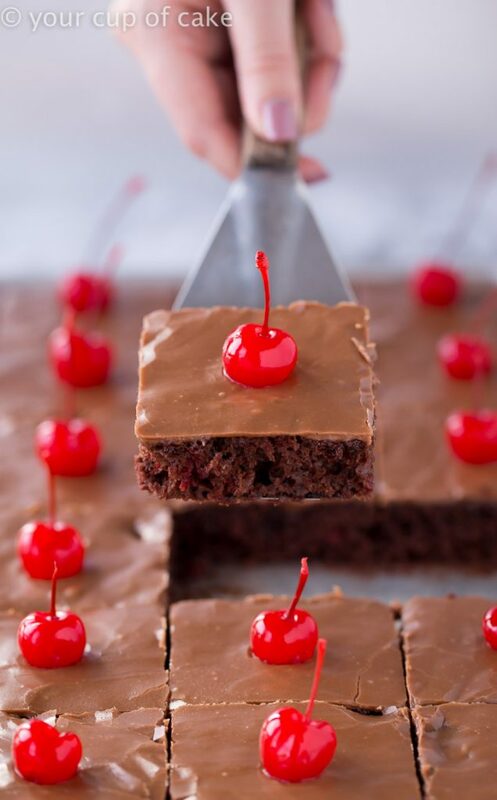 I made this Chocolate Cherry Texas Sheet Cake with Valentine’s Day in mind but it’s perfect all year long! I love the fact that “decorating” it consists of pouring icing and placing some cute maraschino cherries on each slice! 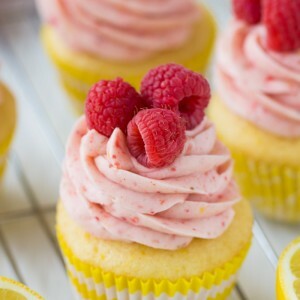 If you want to be suuuper fancy you can always add some sprinkles too. Look at that drizzle! How magical is that? 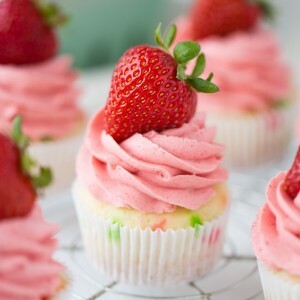 Just pour the icing over and then use a spoon to spread it evenly over the whole thing. I like to let mine cool for at least 10 minutes before cutting into it. 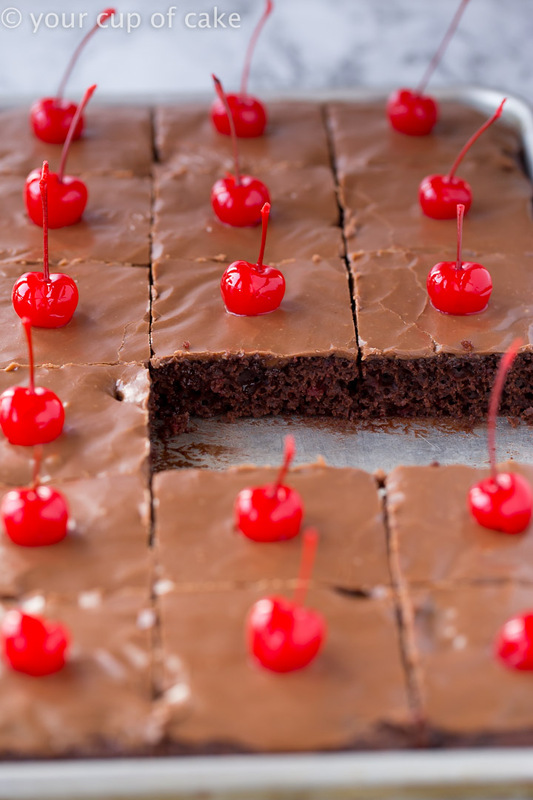 But some people do love eating their Texas Sheet Cake hot out of the oven, so do whatever you like best! I let these ones cool all the way so that I could get really nice lines in the icing for photo purposes. 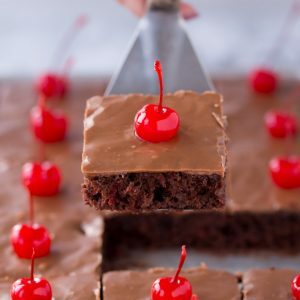 I love a sheet cake that comes out of the pan easily! No ugly slices! Cherry Pie Filling Trick: As I mention in the recipe notes, I like to use a fork to mash up the cherries in the cherry pie filling just a little bit before I mix them into the cake batter. 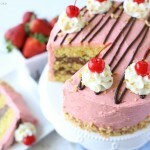 I just prefer small pieces of cherries in the cake as opposed to full chunks of berries. 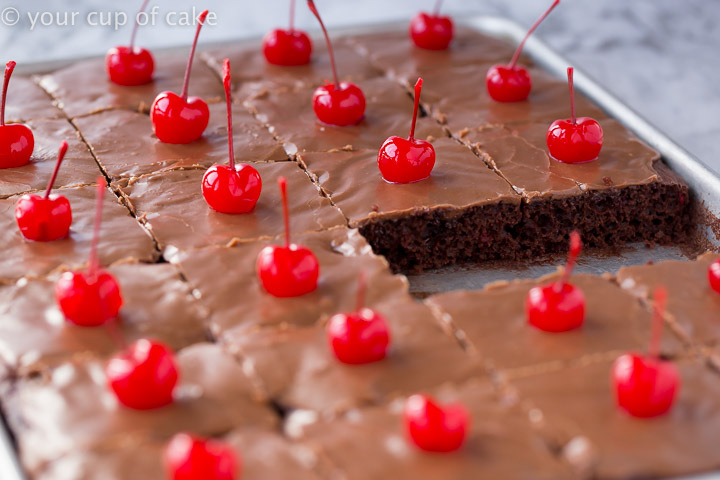 I hope you enjoy this Chocolate Cherry Texas Sheet cake recipe! If you love Texas Sheet Cake make sure to try my Lemon Texas Sheet Cake too! Preheat oven to 350 degrees and grease a rimmed cookie sheet (about 13 X 18 inch). Combine cake mix, eggs, almond extract, milk and cherry pie filling (see note below). Pour into prepared pan, spread out evenly and bake for 20-25 minutes or until an inserted knife comes out clean. 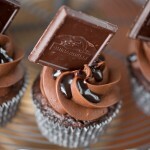 Chocolate Icing: Add butter, milk and cocoa powder to a small sauce pan and bring to a boil (stir constantly). 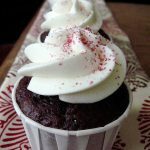 Pour into a bowl with powdered sugar and whisk until smooth. 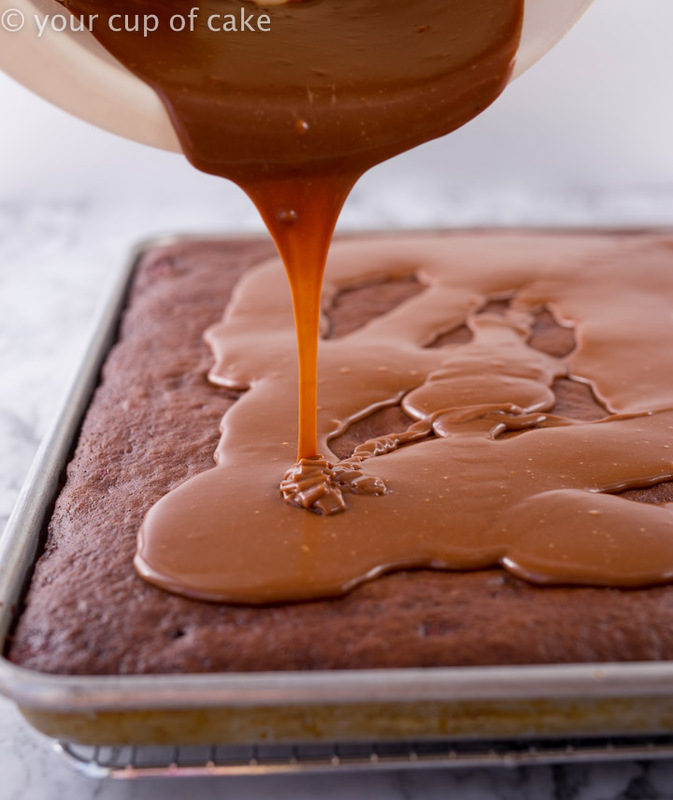 Pour over warm cake and use a spoon to spread evenly. 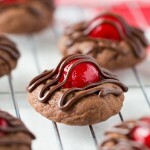 Top with cherries, optional. 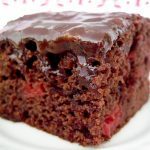 Cherry Pie Filling: I like to use a fork to mash up the cherries a little bit before mixing them into the cake batter. 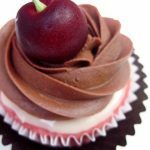 I prefer little pieces of cherries in the cake rather than full berries! I’m new to making sheet cakes, in fact never have!! Can this be made in any other type of cake pan?? 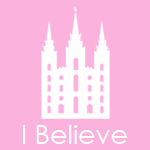 I just made this and used an 11×15 cake pan. I baked it for 20 minutes at 325 degrees in a convection oven. It came out really flat. I can’t imagine how flat it would be using the pan in the directions. Next time I will use a smaller pan.